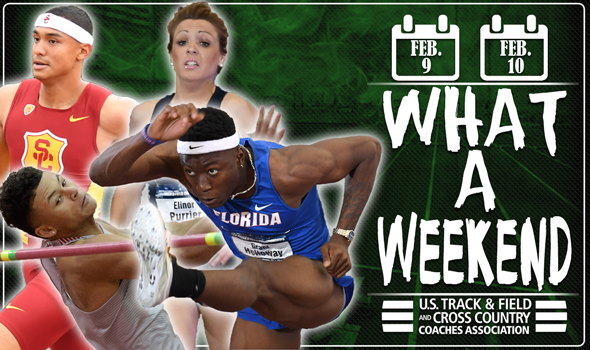 Last weekend was arguably the greatest in the history of collegiate indoor track & field. If you don’t believe us, take a close look at the collegiate indoor record book. A grand total of 66 unofficial top-25 marks were recorded between February 9 and February 11 with 10 of them falling inside their respective events’ top-10. Of those 10 top-10 marks, two were collegiate records set at the Tiger Paw Invitational hosted by Clemson University. Southern California left perhaps the biggest impact on the weekend as it not only broke the collegiate record in the men’s 4×400, its quartet ran the second fastest time in world history. The Trojans got the baton around in 3:01.98 as Zach Shinnick, Rai Benjamin, Ricky Morgan Jr. and Michael Norman all went sub-46.30. Norman needed every bit of his 45.35 anchor leg as he held off the hard-charging Benjamin Lobo Vedel of Florida. Speaking of the Gators, Grant Holloway toppled Omar McLeod’s collegiate indoor record in the 60 hurdles a few weeks after clocking the third fastest time in the event. Holloway cruised to the victory in 7.42, which is .03 faster than McLeod’s mark in 2015. Remember what we just said about Florida in the 4×400? Well, the Gators – with Holloway’s help – notched what is now the second fastest time in collegiate indoor history of 3:02.23. That wasn’t the only No. 2 mark turned in last weekend as New Hampshire’s Elinor Purrier hit a mile time of 4:26.55, which is the fastest collegiate mile by a woman since 2009. While there weren’t any No. 3 marks recorded, two athletes chipped in No. 4 billings: Arizona State’s Maggie Ewen and Oklahoma’s Vernon Turner. Ewen, a finalist for The Bowerman in 2017, heaved the shot 19.20m (63-0) to tie Raven Saunders for third all-time. Turner became the ninth man in collegiate history to clear 2.33m (7-7¾) indoors and tied Texas Tech’s Trey Culver for the national lead. Norman and Auburn’s Akeem Bloomfield waged an epic battle in the open 400 before turning their attention to the 4×400. They turned in the fifth (Norman) and sixth fastest time (Bloomfield) in collegiate indoor history in the process. Southern California’s women and Texas A&M’s men shined in the 4×400. The Women of Troy, who still own the collegiate record, clocked the fifth fastest time in collegiate indoor history, while the Aggie men tallied the sixth fastest for their gender. Here is a complete list of all-time top-10 performances turned in by collegians last weekend. Let’s not forget about a number of athletes who became all-time top-10 performers and athletes from NCAA Division II and NCAA Division III, like David Ribich of Western Oregon and Emily Richards of Ohio Northern, who broke division records.